1 A Prologue made by an vncertaine Authour. This Iesus was the sonne of Sirach, and grand-childe to Iesus of the same name with him; This man therefore liued in the latter times, after the people had bene led away captiue, and called home againe, and almost after all the Prophets. Now his grandfather Iesus (as he himselfe witnesseth) was a man of great diligence and wisedome among the Hebrewes, who did not onely gather the graue and short Sentences of wise men, that had bene before him, but himselfe also vttered some of his owne, full of much vnderstanding and wisedome. When as therefore the first Iesus died, leauing this booke almost perfected, Si rach his sonne receiuing it after him, left it to his owne sonne Iesus, who hauing gotten it into his hands, compiled it all orderly into one Volume, and called it Wisdome, Intituling it, both by his owne name, his fathers name, and his grandfathers, alluring the hearer by the very name of Wisedome, to haue a greater loue to the studie of this Booke. It conteineth therefore wise Sayings, darke Sentences, and Parables, and certaine particular ancient godly stories of men that pleased God. Also his Prayer and Song. Moreouer, what benefits God had vouchsafed his people, and what plagues he had heaped vpon their enemies. This Iesus did imitate Solomon, and was no lesse famous for Wisedome, and learning, both being indeed a man of great learning, and so reputed also. The Prologue of the Wisdome of Jesus the sonne of Sirach Whereas many and great things haue bene deliuered vnto vs by the Law and the Prophets, and by others that haue followed their steps, for the which things Israel ought to be commended for learning and Wisedome, and whereof not onely the Readers must needs become skilful themselues, but also they that desire to learne, be able to profit them which are without, both by speaking and writing : My grandfather Iesus, when he had much giuen himselfe to the reading of the Law, and the Prophets, and other Bookes of our fathers, and had gotten therein good iudgement, was drawen on also himselfe, to write something pertayning to learning and Wisedome, to the intent that those which are desirous to learne, and are addicted to these things, might profit much more in liuing according to the Law. Wherefore, let me intreat you to reade it with fauour and attention, and to pardon Vs, wherein wee may secme to come short of some words which we haue laboured to interprete. For the same things vttered in Hebrew, and translated into an other tongue, haue not the same force in them : and not onely these things, but the Law it selfe, and the Prophets, and the rest of the Bookes, haue no small difference, when they are spoken in their owne language. For in the eight and thirtieth yeere comming into Egypt, when Euergetes was King, and continuing there some time, I found a Booke of no small learning, therefore I thought it most necessary for mee, to bestow some diligence and trauaile to interprete it: Vsing great watchfulnesse, and skill in that space, to bring the Booke to an end, and set it foorth for them also, which in a strange countrey are willing to learne, being prepared before in maners to line after the Law. 1 All wisedome commeth from the Lord, and is with him for euer. 2 Who can number the sand of the sea, and the drops of raine, and the dayes of eternity? 3 Who can finde out the height of heauen, and the breadth of the earth, and the deepe, and wisedome? 4 Wisedome hath beene created before all things, and the vnderstanding of prudence from euerlasting. 5 The word of God most high, is the fountaine of wisdome, & her wayes are euerlasting commandements. 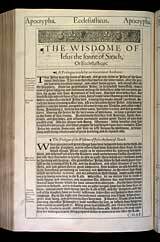 6 To whom hath the root of wisdome beene reuealed? or who hath knowen her wise counsels? 7 Unto whom hath the knowledge of wisedome beene made manifest? and who hath vnderstood her great experience? 8 There is one wise and greatly to bee feared; the Lord sitting vpon his Throne. 9 He created her, and saw her, and numbred her, and powred her out vpon all his workes. 10 Shee is with all flesh according to his gift, and hee hath giuen her to them that loue him. 11 The feare of the Lord is honour, and glory, and gladnesse, and a crowne of reioycing. 12 The feare of the Lord maketh a merrie heart, and giueth ioy and gladnesse, and a long life. 13 Who so feareth the Lord, it shall goe well with him at the last, & he shall finde fauour in the day of his death. 14 To feare the Lord, is the beginning of wisedome: and it was created with the faithfull in the wombe. 15 Shee hath built an euerlasting foundation with men, and she shal continue with their seede. 16 To feare the Lord, is fulnesse of wisedome, and filleth men with her fruits. 17 Shee filleth all their house with things desireable, and the garners with her increase. 18 The feare of the Lord is a crowne of wisedome, making peace and perfect health to flourish, both which are the gifts of God: and it enlargeth their reioycing that loue him. 19 Wisedome raineth downe skill and knowledge of vnderstanding, and exalteth them to honour that holde her fast. 20 The root of wisedome is to feare the Lord, and the branches thereof are long life. 21 The feare of the Lord driueth away sinnes: and where it is present, it turneth away wrath. 22 A furious man cannot be iustified, for the sway of his fury shalbe his destruction. 23 A patient man will beare for a time, and afterward ioy shall spring vp vnto him. 24 He wil hide his words for a time, and the lippes of many shall declare his wisedome. 25 The parables of knowledge are in the treasures of wisedome: but godlines is an abomination to a sinner. 26 If thou desire wisedome, keepe the commaundements, and the Lord shall giue her vnto thee. 27 For the feare of the Lord is wisdome, and instruction: and faith and meekenesse are his delight. 28 Distrust not the feare of the Lord when thou art poore: and come not vnto him with a double heart. 29 Be not an hypocrite in the sight of men, and take good heede what thou speakest. 30 Exalt not thy selfe, lest thou fall, and bring dishonor vpon thy soule, and so God discouer thy secrets, and cast thee downe in the midst of the congregation, because thou camest not in trueth, to the feare of the Lord: but thy heart is full of deceit. I never knew this book exists with do many chapters and principles of life. Is the word of God not what it is? Surely, the word of God shall forever remain true. The best book in the old testement(practical)teaching,I read it, whenever I am worried or confused. This Is Among The Best Books Of The Bible,it Carries Great Inspiration And Motivation Power.